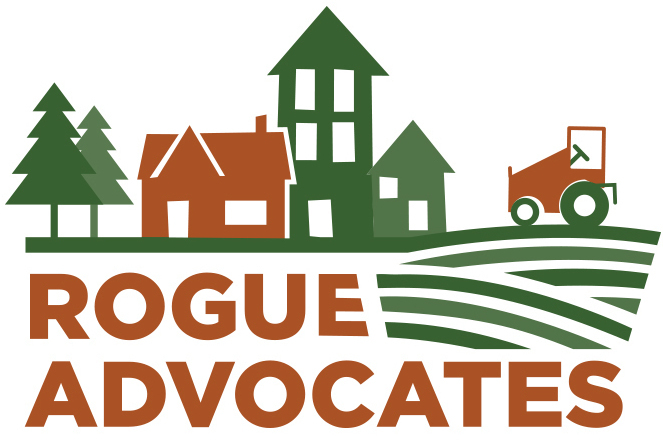 Rogue Advocates has successfully appealed a preliminary Jackson County Planning staff approval to allow an asphalt plant to operate in the Bear Creek floodplain in Talent. The Hearing Officer’s denial is the final decision by Jackson County in an application process that has spanned three years. The County must now require the operation to cease operations. Mountain View Paving had requested Nonconforming Use status to allow the industrial operation to continue business on land zoned for residential use. The company has operated on the site since 2001 without land use permits. A key fact in the appeal was Code Enforcement citations for new structures and facilities constructed without building permits that led the County to require the operation to obtain land use approvals. The expansion of the operation since 2001 created red flags that ultimately has resulted in the denial of land use permits. The City of Talent responded to citizen complaints and also joined the appeal of the Nonconforming Use application. The property is within the Talent Urban Growth Boundary. Talent requested conditions limiting impacts be imposed on the operation, but the County ignored virtually all Talent’s requests. The city discovered their agreements with the County to regulate land use within their urban growth boundary provide the city no authority, even though Talent has written regulations for development in the UGB. This is so good article. this is informative and helpful for me. thanks for sharing such information. This is really a good act by Advocates. http://buy-custom-essays.net is exactly what you need if you've got many tough writing assignments. Hair Transplant in Pakistan, Lahore, Islamabad, Karachi and surrounding areas using latest FUE, FUT strip methods by some of the best surgeons in the world. Useful information, I got a lot of stuff that help me in future.I want to say that please share your post like this,Thank you for this blog !! I must say that this is really nice thing. nice blog !you have posted a very informative .I like to visit your blog again and again .thanks for sharing with us. That is a really nice explained article, http://bbc.com. Is there a way you guys provide assistance to clients by providing them the details about the actual owner of any site? Jasa SEO mengambil situs Anda di atas hasil mesin pencari. Kunjungi http://seo.co.id/ untuk informasi lebih lanjut. Appropriate land use permits reduce conflicting uses with neighbors, in this case the 160 homes bordering this property across Bear Creek. These folks raised health concerns and endured industrial noise, asphalt smoke and fumes for years without relief. Well Nice Decision by Justice deniel. Any of the Company never have right to use any residential land for commercial purpose. This article is such a nice and interesting one, I'm very satisfied with the provided contents. I hope more excellent articles would be posted in your website. Thank you so much for this and keep sharing. It's really nice and meaningful. It's really cool blog. Linking is very useful thing. you have really helped lots of people who visit this blog and provide them useful information. This is a great news, which is about Rogue Advocates Successfully Appeals Mt. View Paving Land Use Permits. They have made a great effort for this and I hope you will keep updating us about this here.